And another pattern finally makes its way off the queue and onto the needles (or hook) in this case. Why? It was Boxing Day - a day in Australia for shopping (Boxing Day Sales are amazing) and then lazing on the couch watching cricket and yacht racing (the Boxing Day test and the start of the Sydney to Hobart Yacht Race). I was almost between projects. (I only had about a 10 cm strip of the flat fox picture to finish and my second longitudinal sock. Yes I know I haven't blogged about them yet. I will soon). It’s ranging between hot-ish and plain damn hot here (40 degrees+) and I needed a summer project that wasn’t too hot to work on on 30 degree plus days. Hence crochet for a change. Though it does seem weird making scarves in summer! 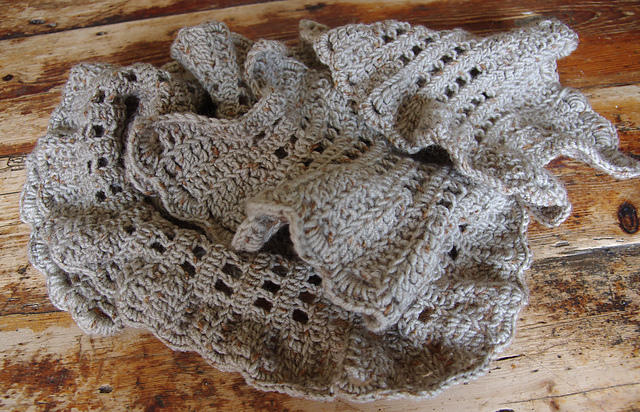 And finally, The Women’s Weekly group I belong to on Ravelry is holding a 2 month KAL/CAL to make a scarf or a cowl in January and/or February of 2014. OK, so I started in a little early. I think they will forgive me. 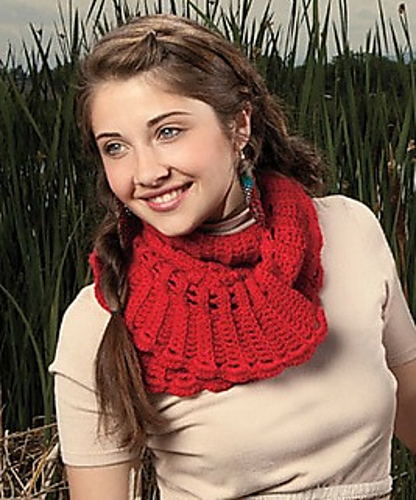 This is the pattern I fell in love with from Interweave Crochet, Fall 2012. 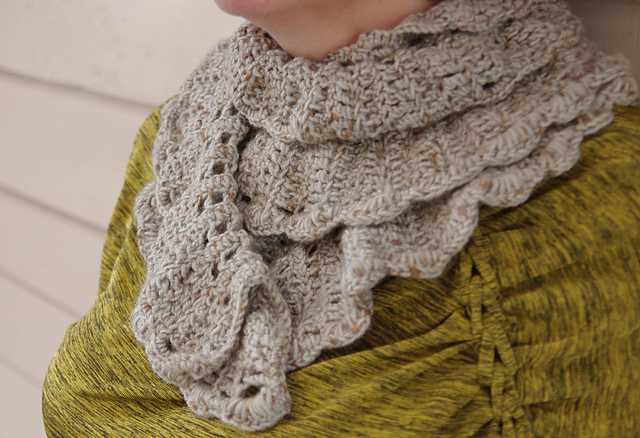 It's called Ruffles Scarf and was designed by Shelby Allaho. I admit I bought a crochet pattern magazine on impulse. I'm so much more a knitter than a crocheter (apart from amigurumi). But there are so many patterns in here I'd like to make. Modern crochet garments are so not your grandmother's granny square poncho or 70's crochet bikini anymore. There are even some really cool crochet socks in here. 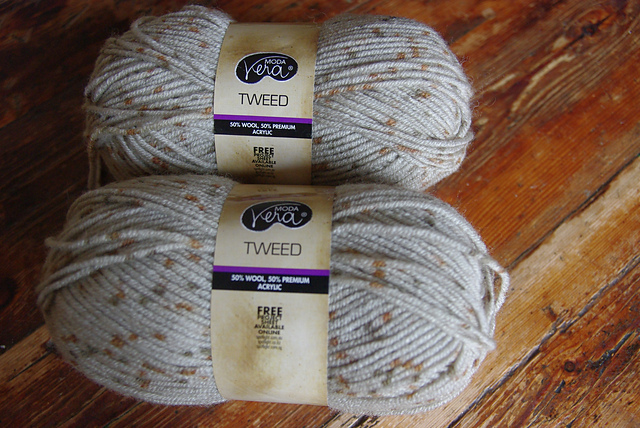 The yarn for this a blend of 50% wool and 50% acrylic so it's light and not too sweaty to work with. I bought this on impulse from Spotlight at the end of the winter on a massive discount because I really loved the colour. And so I began. On the first day I worked the foundation chain and 13 stitch repeats. I dithered about whether the foundation chain was too tight for a while but decided to leave it as the edge is supposed to curve anyway. Messed up third row of pattern and had to unravel a few times because it didn’t look like the picture! Realized I had skim read the pattern not read it properly. I had to remind myself of American crochet terminology as I grew up using the English crochet terms and that's what I'm most familiar with. I decided that American treble crochet stitch (English double treble) which has two loops around the needle before working the stitch is awkward and I need to use my fingers to move the first stubborn loop over the needle, not just the hook! I managed to reach the required 91 rows of pattern after about a week or so. After careful consideration I decided that this was not long enough to wrap comfortably twice around my neck so I added another 30 rows of pattern (121 rows total). I started the side ruffle edging and got about three quarters of the way down one side and ran out of wool. OK, I admit to a small bout of swearing, kicking a few things and throwing the scarf in a corner violently in disgust. Plan B was an excusion back to Spotlight to try to source more wool. There was none available. I wasn't really surprised though. (One shouldn’t go looking for winter weight wool that you bought on clearance at the end of winter on a 40+ degree day in summer). So I did some quick calculations and decide that if I unraveled that extra 30 rows I may just have enough to do the edging. So I took a photo for prosperity before the painful ripping out process. The scalloped edging was looking really cool. I needed evidence of the hard work before I pulled it out. I mistakenly thought the drama was all over. But there was still more to come before I finished it. After unraveling back to 91 rows, I re-began the edging and realised that I had been doing it wrong before by carefully re-reading the instructions and looking at the pattern pictures. I had done a scallop every row and it was supposed to be every second row! No wonder I had ran out of wool! I worked to the end of one side and realised that I was going to have enough yarn to make it a little longer. So I unraveled the edge yet again and added another 10 rows of pattern (now 101 rows long). I worked the edging along one long side (for the third time! ), around the bottom edge, the other long side and top edge and fastened off. I even still have some yarn left! Then I washed and lightly blocked it and it came up beautifully. 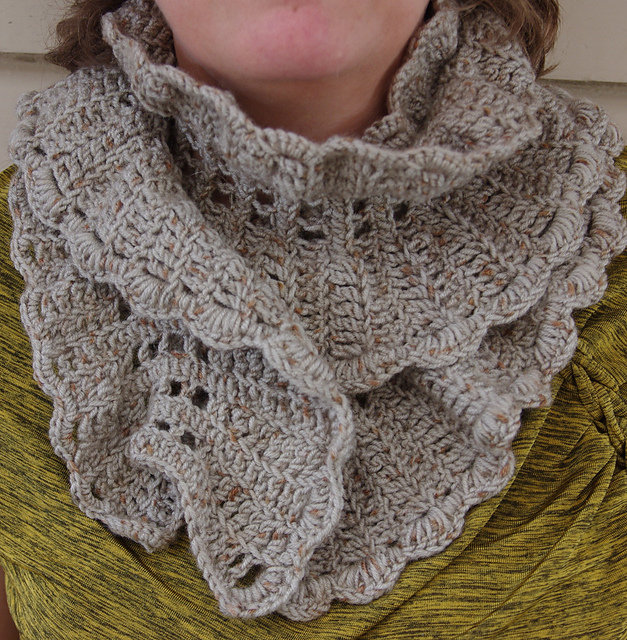 Pattern: Tweed Ruffles by Shelby Allaho. The designer has a dozen suggested ways to wear this scarf pictured on her blog here. And there suggested modifcations to make it a cowl or wristlets. This is the first crochet object I have made from a pattern (apart from granny squares and amigurumi). A major achievement to start 2014! And I am definitely going to do more crochet garments.